I think it's preeetty safe to say that Kualoa Ranch is one of my very favorite venues on the island of Oahu. Between the epic views of Ka'a'wa Valley and the lush greenery, there are just beautiful views every direction you turn. 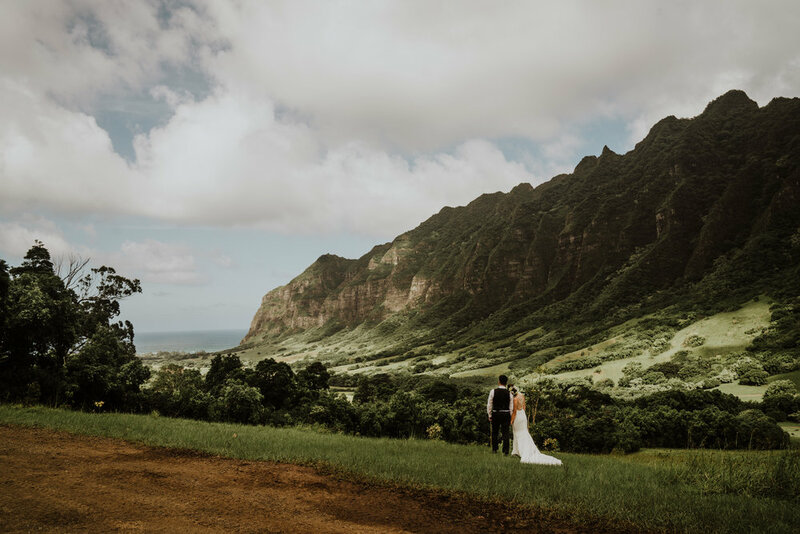 Kualoa Ranch also has some seriously gorgeous spaces for ceremonies + receptions. Ryan + Coco chose Paliku Gardens to say their vows and party with friends, it was the perfect spot for touches of their rustic boho style. Coco + Ryan wanted to bring their families together in Hawaii to celebrate, it's kind of a middle ground between Canada where Ryan's family is from and China where Coco's family is. I love how much of their culture they brought into their day by starting the morning off with tea ceremonies and some games where the groomsmen had to help Ryan compete to see Coco. If you could see the shenanigans that went on, we were dying capturing it all!! Such a fun group to hang out with! After getting ready at the garden, we hit the valley road for the first look. There's something SO dang special about first looks anyway, but when you do this beneath the presence of ancient mountains it just adds another element. It's no wonder Ryan got a little emotional with how freaking stunning Coco looked with orchids in her hair and mountains all around them. And bonus: you get to go rambling around the valley where all the movies like Jurassic Park get filmed! We explored together and found some amazing views for these two to enjoy. Paliku Gardens boasts some breathtaking views of the mountains as well as the famous little island known as Chinaman's Hat there in the distance. Ryan + Coco chose this spot to exchange vows and I'm not mad about it one bit haha as ceremonies go, this one really had my heart. So many happy tears and laughs. For their reception, Ryan + Coco kept things simple and brought in elements that reflect Hawaii as well as home. They have the cutest little pup named Boba, so you could say they are fans of bubble tea. And when you love boba, why not have a boba bar at your wedding?! Combined with the Kona Ice truck, these two definitely helped their friends + family get refreshed for the evening. I've never seen so many happy toasts surround a couple before, you could really tell just how much these two are loved by their friends + family. They were gifted with a video as well from all of the people who wanted to be there but couldn't make the trek.